I’ve been cycling in the French Alps and Provance. In 9 days, we climbed over 57,000 feet on mountain roads often featured in the Tour de France including Mt. Ventoux, Alpe d’Huez, Croix de Fer, Mont du Chat and more. Over 435 miles of riding, I saw the world from a wider and higher vantage point. Mobile devices rock: We had an executive from Cisco on our trip that chose to come even though he was in the middle of a major surge at work. While we kidded him about being glued to his Blackberry, he was also able to ride and work as he needed. We are just scratching the surface of the wireless world’s potential. WI-FI speed & cost constantly trump cellular networks: SKYPE was consistently the least expensive communication network for calls to family and friends plus WIFI web surfing speed is far better. Most hotels have WIFI for free. Just as cellular is killing wireline, ubiquitous WIFI (or something like it) could do the same to cellular. Physical infrastructure: French “A” roads are pothole free and vastly smoother than U.S. interstates. The same difference applies to smaller country roads. One gets a sense that infrastructure of all types matters more than in the U.S. where it’s a discretionary expense. Spaces, style and longevity matter: There is a wider attentiveness to design. 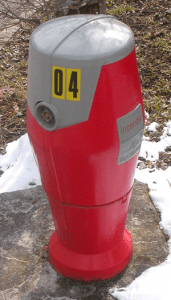 A small example: Fire hydrants are essential but ugly creatures. We saw many with clamshell covers that mimic the playful shapes of Alessi’s cookware products. They might cost more, and possibly protect against vandalism but most importantly, since we’ve got to have them, these are less ugly. This example might not appeal to every reader but it illustrates the basic point. Keeping the old new: Many buildings in France are older than the U.S as a nation. Electricity, modern fixtures and plumbing were added later; hence it’s common to find a sink that’s 1’ by 5” because that’s all that fits. Sometimes it’s wacky; sometimes it’s very imaginative. Small business with larger lives: Throughout the Alps and even in larger cities such as Lyon, it was striking how many small individual shops there are where you’d often find a franchise in the U.S. Franchises have greater economic leverage but the quality, customer contact and integration with the community seemed greater. Not so fast: The overall pace of life, service and innovation is slower. As some of the above comments reflect, at times this is refreshing. At other times, there is a lack of excitement about the future that one finds in the U.S. and Asia.